What is the Common Cause of Accident for Crab Fishermen? Home » What is the Most Common Cause of Accident for Crab Fishermen? What is the Most Common Cause of Accident for Crab Fishermen? Commercial crab fishing has a bad reputation for being one of the most dangerous industries, especially the Dungeness crab fishing industry. According to the U.S. Bureau of Labor, 80 out of every 100,000 crab fishermen die while commercial crab fishing. However, a recent article by the Half Moon Bay Review says that any injuries and deaths sustained while trying to bring these “Dungies” to dinner tables are almost entirely avoidable. How Can Commercial Crab Fishermen Avoid Accidents? According to the Half Moon Bay Review, almost every commercial crab fishing accident occurs when a vessel becomes overloaded or loses stability. Typically, the boat will depart from the harbor carrying too many crab traps. The weight from these traps will cause the boat to ride lower in the water than it should, which leads to vessel instability. Vessel instability is when a boat is particularly susceptible to tipping over, capsizing and flooding. This problem is often made worse when a boat is sailing with strong winds or rough seas. 2016 could be an especially dangerous California Dungeness crab fishing season for several reasons. The season was ultimately delayed when crabs were found to have high levels domoic acid, which can poison those who eat it. However, now that the domoic acid levels have receded to an acceptable amount, fishermen will want to hurry and lay as many traps as possible before the season is over. This means the fishermen will try and load as many traps as they can on their boats, which will likely create instability on a few vessels this year. Additionally, the unusual weather caused by El Nino will create particularly rough sea conditions for fishermen who do not have experience with this type of weather. Commercial crab fishermen must ensure they take time to understand their vessel’s stability limitations and work particularly hard to avoid exceeding those limitations. 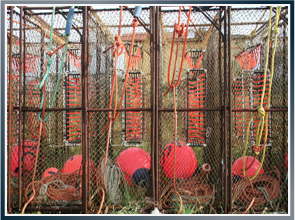 Crab boat operators should never risk the safety of the crew for a few more crab pots. If you’re unsure about your vessel’s stability limitations, you can always contact the Coast Guard Commercial Fishing Vessel Examiner in your area to help. This is actually a free service for fishermen and could very well prevent commercial crab fishing accidents. Latti & Anderson LLP is a maritime injury law firm that helps victims of commercial crab fishing accidents nationwide. Previous What Caused the Deepwater Horizon Accident? Next How is Massachusetts Preparing Fishermen for Emergencies?